By definition, conveyors are pieces of equipment that move materials or objects from one place to another place, from Point A to Point B. You’ll commonly find them in the likes of packaging plants, material handling facilities and auto shops – or really any place that requires the transportation of materials that are particularly large and heavy and would be otherwise difficult and inefficient to move by hand. But they’re found elsewhere around the world as well, which we’ll get to in a bit. The safe transportation of objects or materials. They’re able to move materials and objects of all different shapes and sizes, so virtually everything is applicable. They come in different varieties, and can be powered by many different means. They can be easily and safely installed almost anywhere. Focus on that last point for a moment – they can be installed almost anywhere. This is largely because they can be easily customized to adjust to the environment or setting that they need to be used in. On that note, it probably shouldn’t surprise you to learn that conveyors of all different sizes are out there, from the small to the very large. We decided it would be fun to take a look at the latter types of conveyors – the big ones. Just think of them as the largest of their kind in the world. Here’s a look. India: It’s hard to really pinpoint a location for this massive conveyor, so we’ll just say that it transports limestone from a crushing mine some 35 kilometers away to a Bangladesh cement shop in India. Once considered to be the longest conveyor belt of its time when commissioned in 2005, it is built on and supported by trestles. In addition to the belt running 35 kilometers in length, it is 800 millimeters wide. It’s also worth noting that there are no ends or transfers between both end pulleys. Bottom line – this puppy is a far cry from the conveyor belt that sends your goods down to the bagger at the grocery store. 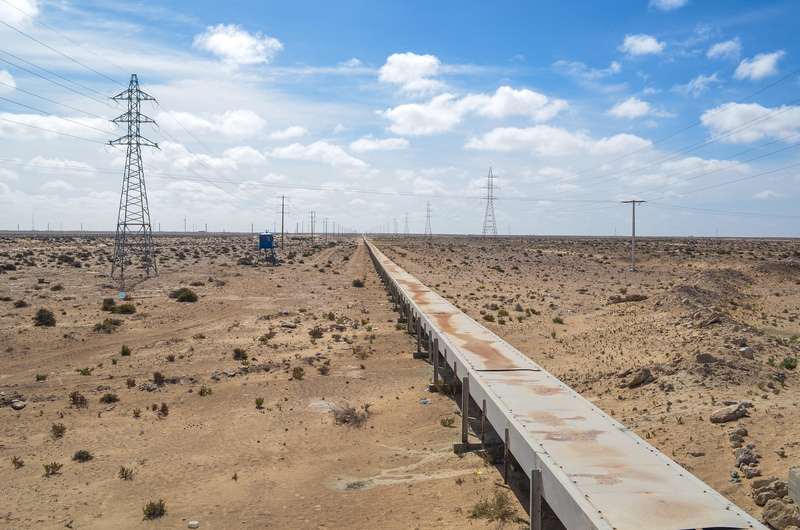 Western Sahara: Said to be today’s largest conveyor belt system in the world, this one in the Western Sahara encompasses some 98 kilometers (or 61 miles) in length. Specifically, it was constructed to transport phosphate rocks from mines in Bou Craa to the port city of El-Aaiun, whether the product can then be exported around the world, mainly to be used as an ingredient in the likes of lawn and yard fertilizers. It’s said that this conveyor system can transport up to 2,000 metric tons of rock per hour. It’s visible from outer space, which goes to give you an indication of how massive it truly is. Also interesting to note is that the desert in the vicinity of the conveyor system also has a blue-colored tint to it from all the phosphate that has been blown off of the belt system by the wind over the years. The blue colored desert can also be seen from space. Peru: It’s said to be the world’s largest pipe conveyor belt, and it rests in Peru – but this conveyor belt happens to be quite the engineering feat. You see, because Lima, Peru’s streets are more narrow than other streets around the rest of the world, the conveyor belt had to be designed and manufactured ever so carefully to conform to them. Today, it’s 16.4 kilometers long and works to bring cement clinker – and at a temperature of 80 degrees Celsius no less – from a cement plant down to the harbor where it can be exported. On its return trip, the belt brings coal and limestone back to the cement plant. The belt’s long stretch is about 8.2 kilometers long, about 6.5 kilometers of it which flows underneath the narrow streets of Lima. A pipe belt was the only way to accomplish the task at hand, notably because it can be built on rough terrain, maneuver tight corners with greater ease and minimize interaction between environment and material being shipped. What’s more is the ability to run this pipe conveyor belt underneath Lima’s streets means that shipping traffic can be reduced on ground level. Andes Mountains: Although still big, this conveyor belt in the Chilean Andes is not the largest in the world. Instead, it holds the world record of being the steepest in the world, with an elevation of nearly 16,000 feet. Specifically, this belt services the Collahuasi mine complex in the mountain range, and building it to handle this type of steep terrain was a necessity in order to adequately transport the product. Dublin, Ireland: Built in 1941, the conveyor belt that encompassed hills, valleys and roads in Dublin, Ireland was once the largest in the world. Although estimates varied on how big and how long the belt actually was, its purpose was clear – to deliver stones to the then-site of theShaster Dam during the time of its construction. The belt, fittingly, was removed following the construction of the dam. Montalieu, France: Known as the largest conveyor belt in all of Europe, the 6.2 kilometer belt inMontalieu, France is designed to carry limestone from a quarry to a cement factory several kilometers away. The belt is powered by three electric motors and can move up to 1,000 tons of product at a time. The belt itself weighs 250 tons. The belt was initiated in November 2014 and is still active today. Rockdale, Texas: At a coal mine in Rockdale, Texas, rests a 19-kilometer long conveyor belt that is designed to easily and efficiently transport coal from the mine to the city of Rockdale. Like several others on this list, parts of this conveyor belt are required to pass underneath the terrain or on very uneven terrain to get product to where it needs to go. The benefits of a belt like this for a purpose like this are its ability to supply coal around the clock – and to supply it affordably. When you think of a conveyor belt, you might just think of a line that works inside an assembly plant or factory – not one that crosses deserts, flows underneath city streets or descends down from mountains. But these conveyor belts listed here just go to show you how flexible these systems are and what kind of potential they have. For more information on conveyor belts contact Bid on Equipment today. What has been bringing buyers to Bid on Equipment through the month of October and what are they looking for when they are here? This last month we noticed a large increase in interest in Electric Motors. Interest in each of these terms has grown 100% – 2000%! When you think of popcorn, the first thing that probably comes to your mind is a movie theater. After all, popcorn just so happens to be the preferred snack while you’re taking in the latest flick at the local multiplex. 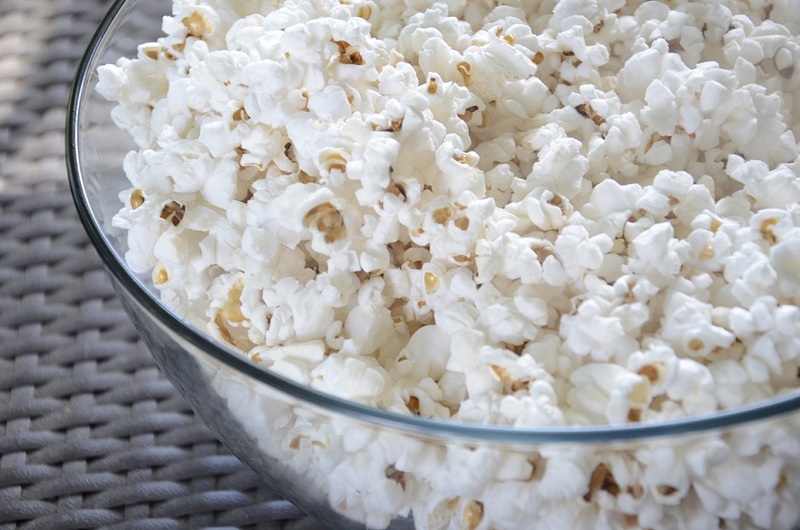 And as you’d might imagine, movie theaters are one of the main locales for the larger, industrial popcorn poppers that can make the tasty treat in large amounts. Giant poppers: These types of machines are generally made of stainless steel, and usually consists of several feet of space. The stainless steel makeup of the machine ensures that the equipment will not rust, which can be a big benefit, especially when oils are brought into the equation. These giant poppers generally have an area for kettle install, as well as a chute that takes processed popcorn to a storage container for packaging and transport. While able to produce a large amount of popcorn, these poppers are generally still compact enough to fit into a backroom. Rotary Dry Popcorn Popper: These types of machines are best utilized on trailers, stands and in portable concessions stands, as they are small and compact, yet effective. Available in electric and gas varieties, these types of poppers are normally made of stainless steel and include galvanized sheet metal throughout the interior to maximize heat application. Most rotary dry popcorn units can hold up to 10 gallons of kernels and pop over 30 pounds of popcorn per hour. Electric Dry Popcorn Popper: These are similar to the rotary dry popcorn poppers that we mentioned above in that they’re compact (yet probably a better fit for a backroom rather than a trailer or portable stand), made of steel and effective. One neat feature on most of these types of models, however, is that they automatically dispose of unpopped kernels into a waste drawer during the reversal of the cylinder. Enclosed Machines: Available from manufacturers such as Coronado, these massive popcorn poppers are ideal for the likes of sports stadiums that must serve a lot of people within a brief window of time. So, as you might imagine, they’re best utilized in the backroom concession areas of such facilities, as they are not the most portable of popcorn poppers currently on the market today. These enclosed units typically include an oil pump, a large cabinet where the popping is actually done, a drive motor, warmer to keep the food hot over long periods of time and a heat diffuser to ensure that there’s even heating – and thereby efficient popping – for kernels no matter where they are located. These machines are typically constructed from stainless steel and come in a range of sizes to suit just about any venue. Open Machines: There are enclosed popcorn poppers, and then there are open popcorn poppers. And while we covered the enclosed type in the above section (which are ideal for open venues and sports stadiums), open machines are better utilized in venues and forums where the building is covered. Like enclosed machines, these types of poppers come in a wide variety of different cabinet sizes to meet the needs of any venue. And also like enclosed poppers, these machines aren’t easily moved, which is why they’re best utilized in the back concession areas of sports stadiums, concert halls and other large venues. Finally, like their enclosed counterparts, this type of popcorn popper is among the most expensive that you can buy on the market. Typical price tags for brand new enclosed and open poppers can range up to $10,000 in price. It’s also worth noting that when it comes to popcorn poppers, let alone any other type of commercial, industrial equipment piece, they’re not inexpensive to come by. You can see that just from the enclosed and open popper sections that we mentioned above, and certainly the same can be said of the other options that are presented on this list. Yes, depending on the size and style of the equipment, new machines can range in price anywhere from a few thousand dollars to well into the tens of thousands of dollars. Needless to say, but for many companies, no matter whether an existing popcorn machine has unexpectedly broken or it be trying to get into the business of popcorn production, this can be a lofty expense. And that’s why if you’re ever in the market for a popcorn popper and don’t quite have the capital to buy brand new, you should consider going the used route. When doing business with a credible venue, such as Bid on Equipment, you can ensure that you’re getting like-new equipment at a used price. This is a win-win for you, as you don’t have to break the bank getting your operations kick started and can still rest assured that you’re getting a good product. For more information on popcorn popping equipment, and to browse Bid on Equipment’s selection of used machines in stock, contact the company or visit it online today. What has been bringing buyers to Bid on Equipment through the month of August and what are they looking for when they are here? This last month we noticed a large increase in interest in Machine Shop and Tools including Lathes,Grinding Machines, and Machining Centers. Below are the top ten search that have shown the largest increases from Internet search traffic this month. Interest in each of these terms has grown 170% – 1100%! The types of pumps: While there are a variety of different pumps out there today, they generally fall under two main categories – positive displacement andcentrifugal. Specifically, a positive displacement pump traps an amount of fluid and then forces it through a discharge pipe. There are several sub-categories ofpositive displacement pumps, including rotary-type, reciprocating-type and linear-type. Some examples of rotary-type displacement pumps include the likes of gear pumps, screw pumps and rotary vane pumps. Plunger pumps, diaphragm pumps, piston pumps and radial piston pumps are all examples of reciprocating-type pumps. Centrifugal pumps, on the other hand, transport fluids by converting rotational kinetic energy to hydrodynamic energy of the fluid flow. Centrifugal pumps are commonly used in more industrial applications, such as water, sewage and petrochemical pumping applications. The roots of centrifugal pumps date back to the late 1400s, though true centrifugal pumps didn’t become available until the 1700s. Axial-flow pumps are another type of pump that, while classified in a different category than a centrifugal pump, operates in the same sort of manner. 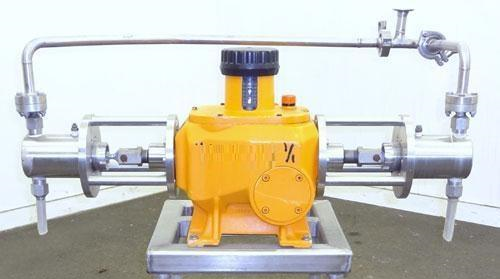 Aside from electric motors, mechanical pumps are the second most common machine in the world. Pumps need regular maintenance: While pumps are expensive (more on that later), one of the most expensive costs of ownership associated with pumps is failure due to unscheduled maintenance. In fact, it’s estimated that pump failure costs range anywhere from $2,600 to $12,000 (the average is said to be around $5,000). Pump fires are another source of destruction, as it’s estimated that one pump fire occurs per every 1,000 failures. You won’t go through a day without using pumps: Even though you may not notice it, pumps play a vital role in many activities that you partake in throughout the day. For instance, every time you flush the toilet, a pump transports wastewater to a sewage treatment facility. When you drive your car, a fuel pump injects gas into the vehicle’s engine (on that note it’s worth mentioning that the typical car may have up to 12 pumps under the hood). A sump pump in your basement works to keep water away from the foundation after heavy rainfall. The fish aquarium in your living room is kept clean with the help of pumps. The applications – as well as your encounters with pumps – are vast. Pumps are widespread: It’s estimated that pumps presently account for about 10 percent of the world’s total energy consumption, just based on the diverse range of applications they help power. Pumps have made great strides in energy efficiency: Not too long ago, it was estimated that 2 out of every 3 pumps were wasting energy. It was also estimated that pumps wasted energy an estimated 95 percent of the time. That’s not the case these days, as pumps have really been developed to use less energy and operate more sustainably. In fact, it’s estimated that switching to these more energy efficient pumps on a grander scale would be equivalent to a 4 percent savings in terms of world energy consumption. On micropumps: The smallest types of pumps are known as “micropumps.” Their origins date back to the mid-1970s and are used particularly in microfluid research settings. Micropumps can be integrated into both mechanical and non-mechanical applications. The first commercial micropump was announced in 2003. Pumps can be expensive: Whether it’s for microscopic medical applications or for large, industrial purposes, pumps aren’t necessarily cheap. In fact, they can cost anywhere from a few hundred dollars to tens of thousands of dollars. Thankfully, when it comes to purchasing a new pump – for whatever the application is – there are other options aside from purchasing brand new. These include buying used, such as through a website like Bid on Equipment. When purchasing product through a site like this, you’re getting a like new product for a used price – and that can be a real money saver when it comes to buying expensive, capital equipment such as this. As you can see, pumps are equipment that we take for granted in a variety of different things that we do every day. And now that you know a bit more about these crucial appliances, keep in mind these intangibles the next time you drink a glass of tap water, drive your car or are feeding the fish in your home aquarium. For more information about pumps – and about how to purchase them – visit Bid on Equipment at www.bid-on-equipment.com or call 847-854-8577. Simply put, an air compressor is a device that converts power into energy by forcing air into a small volume and thereby increasing pressure. This energy in the compressed air can then be stored as the air stays pressurized. Most air compressors are either powered by an electric motor, diesel or gasoline engine. They are available in a variety of different styles, from compressors that operate via either positive or negative displacement, to low-, medium- and high-pressure models. This article is intended to give you a well-rounded scope about air compressors, as well as explain how buying used can save you money and still allow you to attain a quality product. Powering tools: Nail guns, jackhammers and other power tools are commonly powered by air compressors. This is beneficial because air compressors help add an additional element of safety to the task at hand, as there is little to no electricity involved on job sites. For powering HVAC pneumatic control systems. For creating pressurized air for large scale industrial processes. Aside from these aforementioned applications, it’s also worth noting that air compressors are being increasingly used and explored for new applications in new industries and markets. Piston-type, which rely on the constant movement of pistons as a means of pumping air into the chamber. One-way valves guide air into this chamber, where the air is then compressed. Rotary screw compressors, which are devices where air compression is based on two helical screws and positive displacement. In rotary screw compressors, the helical screws turn and guide air into a chamber. Vane compressors, which is a type of compressor that delivers very high levels of air pressure at fixed volumes. These types of compressors work by using a slotted rotor and blade placement to guide air and reduce volume inside the chamber. Negative Displacement: The big difference between negative displacement air compressors and positive displacement air compressors is that those of the negative variety incorporate centrifugal compressors and thereby use centrifugal force to accelerate and decelerate the captured air. Permanent Mount: These compressors are generally cheaper than their portable counterparts. They are also generally more effective and can provide users with varying levels of power depending on the application. Upgrading the systems are generally easier and permanent mount compressors come in many electrical powered options. Maintaining them is also typically easier than other types of compressors. The big downside to permanent mount air compressors is that they’re not portable and it’s a rather large undertaking if it ever needs to be moved around a facility’s floor. Portable: Unlike permanent mount compressors, the big advantage to portable compressors is their versatility, as they can easily be moved around warehouses, garages, etc. For this reason, portable air compressors are generally the most common types that you’ll find around auto shops, as they can be maneuvered from car to car to ensure each vehicle being serviced has the proper air pressure. The downside to portable compressors, however, is that they’re more expensive than permanent mount ones and they’re generally not as powerful. Aside from permanent mount versus portable compressors, air compressors are also measured by the amount of air pressure that they deliver. Hence, there are low-pressure air compressors, or LPACs, which discharge pressure of 150 psi or less, medium-pressure compressors, which discharge pressure of 151 psi to 1,000 psi, and finally there are high-pressure air compressors, or HPACs, which discharge pressure over 1,000 psi. A good air compressor, whether it be a portable unit or a permanent mount unit, can cost several hundred dollars. And while air compressors certainly aren’t the most expensive accessory that a homeowner can have in their garage or a company can have on its shop floor, the upfront cost does cut into a company’s bottom line and it is a significant purchase. That’s why it’s important to note that buying used is a viable option when it comes to these accessories. That’s where a service like Bid on Equipment comes into the picture, as it specializes in buying used industrial equipment and then selling it as previously owned merchandise to interested parties by the way of a bid. Simply put, purchasing an air compressor by these means will still allow you to secure a good product in an air compressor, but without the price tag of buying brand new. It’s something to consider when you’re looking to acquire a new piece of equipment, whether it’s an air compressor or some other piece of industrial equipment that you’re looking to acquire. 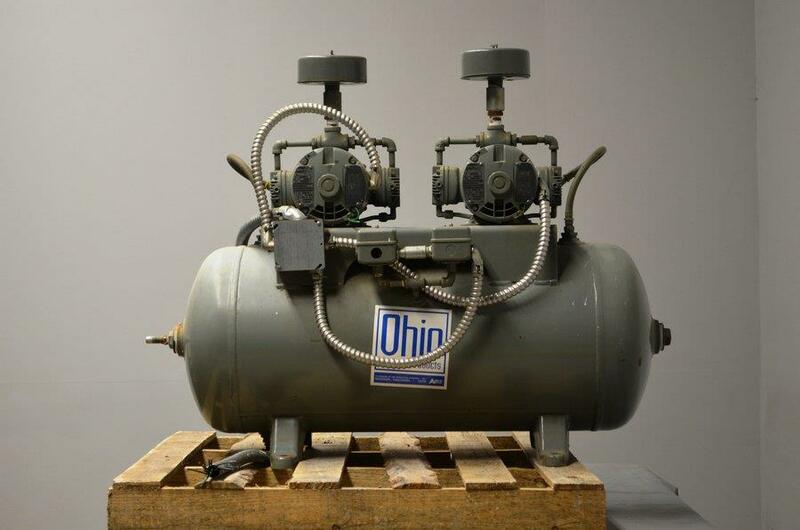 For more information on the benefits and types of air compressors that are on the market today, and to learn more about Bid on Equipment and the possibility of purchasing a used air compressor, either visit the company at www.bid-on-equipment.com or call them at 847-854-8577. Bid on Equipment accepts bids 24 hours a day, 7 days a week. Contact them today for more information. One of the biggest pushes for entrepreneurs lately has been to start a micro brewery. In fact, according to estimates from the Brewers Association, as of 2014, it’s estimated that there were 2,000 micro breweries and about 3,500 brew pubs located throughout the United States. Compare these numbers with what they were just four years prior, in 2010, and the growth is astonishing. For instance, according to Brewers Association estimates, in 2010, there were just 620 micro breweries and a little over 1,000 brew pubs – so that’s a lot of growth in this industry in a matter of just four years. As you can see, the brewing industry has grown rapidly in recent years, and will likely only continue to grow as consumer attitudes trend more away from name brand beer and more toward specialty craft beer. But if you’ve ever thought about opening up a brewery to capitalize on this trend, it’s worth noting that there’s a lot of hard work required to make it succeed and a lot of capital equipment you need in order to make your beers. In fact, according to estimates from Metropreneur, the cost to start a brewery can range anywhere from several hundred thousand dollars to several million. Much of this is based on the size of your establishment and how much volume you need to produce, as well as whether or not you’re going to bottle beer and sell off site. With capital equipment that can cost this much money, it may be worthwhile for new startups to invest in used equipment, rather than brand new equipment. This post will take a closer look at what’s necessary to open up a brewery, as well as provide an overview of the beer brewing process. Generally speaking, the minimum system brew pubs can operate with is a seven-barrel system. This is sufficient for small- to mid-sized brew pubs (think about 125 seats) that do the vast majority of their business on site. Breweries that are larger, or expect to sell product off site, will need at least a 10-barrel system. Furthermore, a seven-barrel system takes up to 1,000 square feet of space, while a 10-barrel system may take up to 1,700 square feet. As we noted previously, this equipment isn’t cheap. In fact, some estimate that, minimally, a new brewery is looking at at least $250,000 to $300,000 in equipment costs alone, with the average brewery investment coming in somewhere around $500,000. Most startups, of any kind, don’t have this type of money to spend and limited borrowing allowances. That’s why it can be so beneficial to purchase used, rather than new, equipment – especially through a reliable, credible source such as Bid on Equipment. By purchasing used through such a source, you’re acquiring gently used equipment that still runs like it’s new, and it’s this quality and affordability that can be so important when it comes to new brewery startups. Mashing: This step consists of mixing milled grain and water, and then heating this mix. Why heat it? Because the heat allows the enzymes in the malt to break down the grain starch into sugars. Lautering: Lautering consists of separating extracts won from the grain during the aforementioned mashing process. This is done either via a lauter ton or a mash filter. Lautering is a step that consists of two stages. The first stage is known as “wort runoff,” and consists of extract separating from the grains. The second stage in lautering is “sparging.” This consists of any remaining extract with the grains being washed off. Boiling: Worn extracts are also known as “wort,” and boiling these sterilizes them. Hops are added during the boiling process, which helps give the beer its flavor. Conditioning: This stage consists of cooling the beer to temperatures that are around freezing. This allows the yeast to properly settle and proteins to then settle out of the yeast. This stage also helps give the beer a smooth taste. However, it’s worth noting that keeping the beer pressurized is essential during this stage, or else it risks going flat. Filtering: While not all beer is filtered, it’s this stage that can really round of the flavor of the beer. There are a variety of filters that breweries use, the most common being pre-made sheets or candles. Filling: The final step in the beer brewing process, this involves filling, or packaging, the final product. This is especially important for breweries that intend on getting their product to consumers outside of their brewery’s confines. Beer can be filled into a variety of different containers, from bottles to cans to other sorts of packaging. As you can see, opening up a brewery isn’t something to just do on a whim. It takes a lot of capital to get things up and running, and it takes a lot of skill and trial and error to make a great tasting beer that people are going to want to buy and consume. 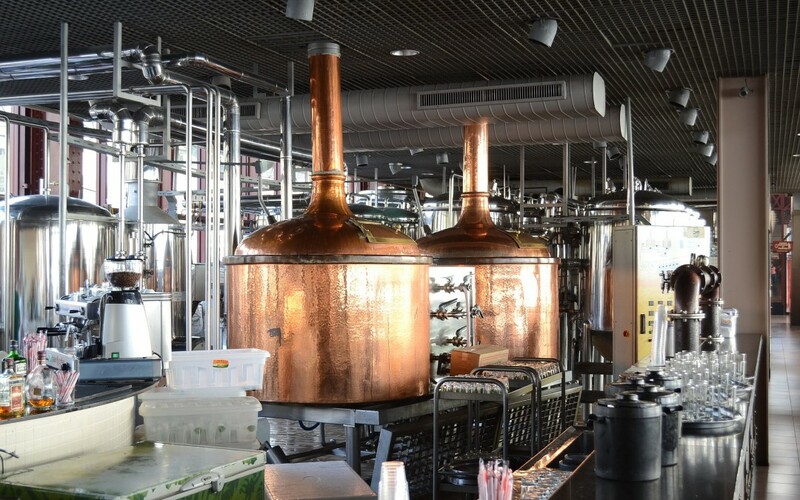 The brewing process is up to you to master, but when it comes to equipment, it can make sense for new breweries to buy used and save money up front. By buying used, you’ll be getting an effective, efficient like-new piece of equipment at a much cheaper price. For more information on buying used, contact Bid on Equipment today. We packed this post full of information on Cartons. Can you contain your excitement? What is a carton? Simply put, it’s a box or some sort of container, usually made from paperboard or cardboard. 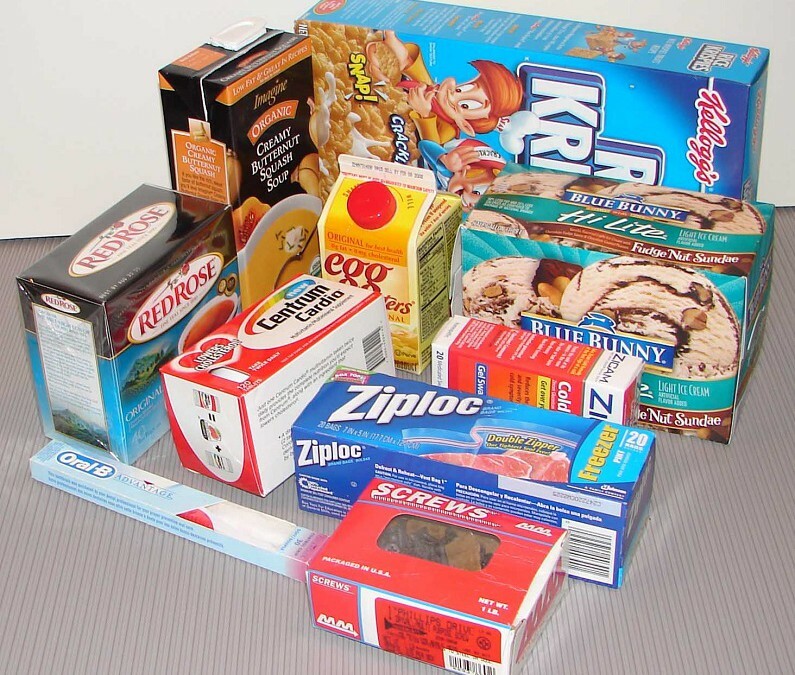 There is a multitude of different cartons, most of which are used in packaging applications. For instance, you’re probably familiar with egg cartons, as these hold eggs and prevent them from cracking. Folding cartons are another popular type of carton. These come in all different shapes and sizes and are used to store the likes of non-perishable foods, pharmaceuticals and more. Milk cartons, which are also commonly known as “aseptic cartons,” are another popular type, although the majority of these have been replaced with plastic jugs over the years. While you likely come across cartons often – if not every day – they are arguably one of the things that are likely more taken for granted in life. In fact, the packaging roots of the carton date back to the late 1800s, when Robert Gair created the first carton as we know it today in Brooklyn, New York. Years later, the National Biscuit Company began administering cartons to package its crackers. From there, the carton itself – as well as the equipment that create cartons – evolved into what we now know today. Cartons are created by a cartooning machine, or a cartoner. Cartoners are divided into two main categories – horizontal machines or vertical machines. As you might have been able to guess by the nature of the two types of cartoners, horizontal machines fill cartons horizontally through an opening, while vertical machines fill them through a top, or vertical, opening. Seal end: This is one of the most popular types of folding cartons, characterized by one end that’s open and one end that’s sealed. Think of them sort of like a cereal box, as the bottom is usually sealed closed, but the top is able to open so that cereal can be poured. Specifically, the carton is glued along its depth and the top and bottom flaps are then folded over and sealed with glue after it has been filled with product. Sleeve: Just like shrink sleeves, carton sleeves are mostly decorative in nature, and fit over an existing carton or piece of packaging to make it stand out more on store shelves or include some type of special promotion. Sleeves are usually open at both ends and simply slip right over the other carton or packaging. Aseptic carton: These are the types of cartons that are best used for liquid packaging purposes. Specifically, they’re usually made from the likes of laminate, foil and polyethylene. They’re best utilized for the likes of storing and packaging milk, juice and soup. Gable top: These types of cartons are similar to aseptic cartons in that they’re used to house liquid substances, such as milk and juice. They consist of polyethylene that’s been coated over liquid packaging board. The big difference between gable top cartons and aseptic cartons, however, is that most gable top cartons are opened by pulling a top out and pulling a spout area out. Some even consist of fitments, which help with pouring. In terms of aseptic and gable top cartons, it’s also worth noting that these can be further broken down in carton subcategories: refrigerated and shelf stable. As the names imply, refrigerated cartons are designed to go into the refrigerator, while shelf stable ones are not. Hence, where such cartons – and the products inside – will be stored largely dictates how they’re made and what materials they’re made of. Folding cartons: There are a bevy of different types of folding cartons (including seal end and sleeves that have already been mentioned on this list), but as folding cartons are among the most popular type of carton there is currently, they’re worth a separate entry on this post as well. Folding cartons are available in a variety of different tray styles. Some of the more popular (aside from seal end and sleeve) include tuck top auto bottom, tuck top 1-2-3 bottom, tuck end, four corners beers tray, lock corner tray, kwikset tray and walker lock tray. Egg cartons: We already touched a bit on egg cartons in the intro to this post, but as they’re one of the more popular and recognizable cartons today, they’re worth mentioning again in a bit more detail. Specifically, egg cartons are usually made from molded pulp. This material uses recycled newsprint to protect the eggs, both during shipment of the product as well as within the home. While molded pulp is still among the most popular material that egg cartons are made of, PET and polystyrene are other popular material options for this carton. No matter the carton, one thing is for sure – in order to quickly and adequately manufacture cartons, you need a cartoner. And while cartoners speed the carton fabricating process and increase a facility’s efficiency, this is capital equipment – and it’s not cheap. That’s where buying used cartooning equipment from a reputable outlet such as Bid on Equipment comes in handy, especially for facilities that can’t afford a big purchase or that need to unexpectedly replace a damaged or broken cartoner. At Bid on Equipment, you’re able to get like new capital equipment at just a fraction of the price. So instead of spending hundreds of thousands of dollars on cartoners, perhaps you’re buying it tens of thousands of dollars cheaper. Cartoners play a big role in qualified facilities, as they don’t just create the cartooning at a fast pace, but many can even actually fill the cartons with product and seal the cartons too. For more information on cartons – and cartooning equipment – contact Bid on Equipment today. If you’ve spent any time in a hospital, there’s no question that you’ve been in the presence of an autoclave. Autoclaves are somewhat of an unsung hero in hospital environments. Specifically, they’re pressure chambers that are used to sterilize equipment (i.e. surgical instruments, tools, etc.). This is done via high-pressure saturated steam for up to 20 minutes (although times depend on the exact load size of the items and the contents of the items themselves). This post will take a closer look at all things autoclaves. Just think of it as the ultimate guide to this vital piece of equipment. Items are placed into the unit’s sterilization chamber and the door is shut and sealed to secure them. The unit is then heated to a point where it becomes effective for 100 percent sterilization. Normally, units are heated between 267 and 273 degrees Fahrenheit. After the unit reaches that temperature, the timer starts for the extent of the sterilization run. Throughout the 15-20 minutes that the unit works to sterilize the equipment, steam is routinely pumped into the sterilization unit. 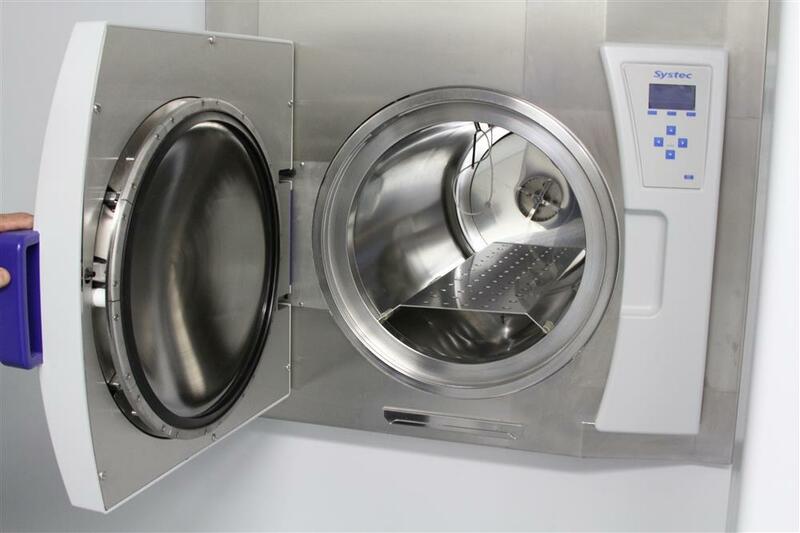 Following the 15-20 sterilization process, the chamber releases its pressure and steam, thereby allowing the items inside to properly cool, dry and ready for use. There are two general autoclave cycles – gravity, which is also commonly referred to as “fast exhaust,” and liquid, or “slow exhaust.” The former is the cycle best used for dry goods and glassware, while the latter is used for liquids. The big difference between the two processes is that the liquid, slow exhaust method works to keep the liquid it is treating from boiling. Autoclaves are also designed to be very safe when in operation. Obviously, steam at this high of a temperature can really do so damage. That’s why these devices are packed with security and safety features to minimize the risk of injury. It’s still advised that professionals have the proper training on how to use and operate an autoclave before attempting to sterilize any equipment, however. We’ve already covered some of the key environments for autoclaves – hospitals, vet offices, industrial settings, microbiology settings, dentists offices, etc. But there are a few other notable environments that we’ve yet to discuss. These include funeral parlors and waste treatment facilities. In a nutshell, autoclaves are used in environments where contents need to regular be sterilized, so it makes sense that they would be growing in use within the likes of waste treatment facilities. The pressurized steam and super hot water can eliminate infectious diseases and other potentially harmful agents that could make people sick. As noted, funeral homes are another popular environment for these devices. How Much do Autoclaves Cost? Although autoclaves work similarly to a pressure cooker, don’t be fooled about them also being similar in price to a pressure cooker – they’re much more expensive. Autoclaves typically cost several thousand dollars per unit, with some more advanced units even costing tens of thousands of dollars. And while hospitals and high-end medical environments usually have the budgets to buy brand new and pay brand new prices, many of the other settings that utilize such equipment cannot. That’s where buying used or bidding on used equipment through credible, reputable sites such as Bid on Equipment can come in handy for companies and startups that are looking for a quality piece of equipment, but aren’t looking to break the bank. Tattoo parlors, for instance, that want to replace or add an autoclave sterilizer to keep customers as safe as possible might not have thousands of dollars to spend. That’s where a used piece of equipment may come in handy – both for the purpose they intend to use it for as well as how it pertains to their bottom line. As you can see, autoclaves play a big role in many different environments. And each of these environments will determine the size of the autoclave you need, which thereby helps determine the expense of the equipment. While you can buy new or used, it’s often not feasible for many to pay brand new prices. That’s where buying used from Bid on Equipment comes into play, as you can get like-new equipment for used prices. For more information on autoclaves, and to learn about how acquiring them through a service like Bid on Equipment can help you and your operations, contact us today.